If you want to buy a house, you’ll have to have an income of some sort. My income at Ordina is not bad at all for an intern, yet it is far from enough to pursuade the bank to lend me the sack of money needed to buy our house. Therefore, I’ve decided to take up the offer graciously made by Ordina to become a trainee for a year. The fun starts at April Fool’s (and it’s not a joke 😉 ) and will last for at least a year. Big things are about to happen in the next couple of months, I’m really looking forward to it all! Thanks for the lovely bouquet Reggie! Each and every day there seems to be news about Geert Wilders, his Islam-critic film Fitna, "Boerkinis", troublesome (islamic) allochthonous youth and more. One could say it’s the Islam, or rather the fear around it, that’s keeping the reporters and our politicians busy. To start with Fitna, the recently completed but still unviewed critical film about the Islam and the Koran by Geert Wilders is stirring up dust since plans to make it were unveiled. There have been protests in Iraq, Iran, Afghanistan and Saudi Arabia, a detahwish has been proclaimed by a religious leader in Iran, and even people have been killed in the demonstrations against the film. Why, I hear you ask? Apparently because of the inability of the inhabitants of the country in question to protest without killing some of the people marching on their behalf. But that is not at question here. Fact is, that Wilders has agreed to showcase the film one day prior to its public unveiling to our National Coordinator Terrorismprevention, Joustra, one the sole condition it is not to be banned after that. Why even bother to showcase it at all before its release? To give the NCTb a head start of one day in coordinating the actions necessary to prevent terrorism? Furthermore, the cabinet and its ministers are nearly daily criticising Fitna, or warning the maker about the social concequences his film might have. Last week, Balkenende has warned Wilders that the response from our country might be more violent than expected and he has advised him not to release it if it will trigger such responses. Pieter van Geel (leader of the Tweede Kamer fraction of the CDA) and Maxime Verhagen (CDA) both have urged Wilders to take his responsibility and not release the film at all last Thursday. Wilders himself responded, as can be suspected, with the words: "Jullie kunnen de pot op". The politicians are so busy trying to stop the film because it would trigger radical actions from the islamic community in our country that they are overseeing the damage they are doing to our country as it gives a really bad image towards other countries. The question remains what would have happened when Fitna was not given the attention it has gotten recently. One could only imagine what would’ve happened with the Iranian government threatening to boycot us, the religious leaders in Afghanistan who would thus not call to murder all infidels and those opposing the Koran. I know it is a long shot, but my guess is it would not have been like this. Rhetorical and polarizing: at least my question is not being criticized by the government (yet). As many of you know, I’m currently doing an internship at Ordina since the last week of July. 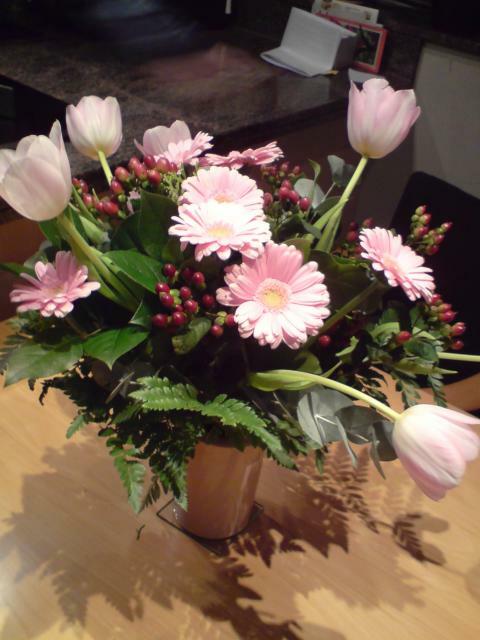 To my great surprise, I found a note yesterday stating I could collect a bouquet delivered for a mr. Tijhof. Curious as I was, I went to our neighbours to retrieve the flowers only to find out they were sent for me! Who on earth could be sending ME a flower bouquet? Turns out it’s from the business unit I’m currently doing my internship with, so I’d like to thank you all for this fine present!